According to Mark Twain: “A cauliflower is nothing but a cabbage with a college education.” The word “cauliflower” derives from the Italian cavolfiore, meaning “cabbage flower”. Cauliflowers have been around for a long time and they continue to evolve. Their history and ancestry traces to the wild cabbage and references note that it was popular in Europe as early as the 15th century. It came to America in the 1800’s we think but wasn’t commercially available here until the 1920’s. It is one of several vegetables that belongs to the species Brassica oleracea which also includes broccoli, brussels sprouts, cabbage, collard greens, kale, mustard and turnips which are collectively called “cole” crops. Many think that the word “cole” is a variation of the word “cold” because they grow better in cold weather. Actually “cole” is a variation of a Latin word that means stem. That creamy head of cauliflower is made up of hundreds of immature flower buds that grow to form the head or “curd” (because it resembles cheese curd) which we are so familiar with. Though we usually discard the leaves in favor of the curd, they are also edible and delicious given its cabbage heritage. Cauliflower is a powerhouse of nutrition. It’s rich in vitamin C with a half cup of florets providing nearly half the daily requirement for vitamin C. It also provides a good amount of fiber, vitamin A, folate, calcium and potassium as well as selenium, which works with Vitamin C to boost the immune system. Cruciferous vegetables such as cauliflower are also known for their high levels of cancer-fighting phytochemicals known as glucosinolates. It’s also a great alternative for potatoes (mashed, in soups, etc.) which have a high glycemic index and can spike blood sugar quickly. 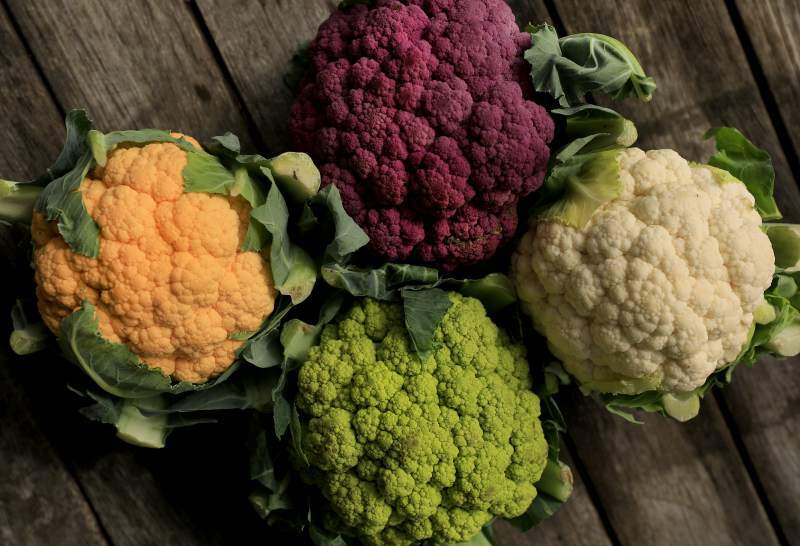 Cauliflower comes in a carnival of colors. White is usually what we see in the market, but it also is available in orange, purple and green. All retain most of their color when cooked. Orange or “cheddar” cauliflower ranges in color from coral to a bright sunburst orange. Its hue comes from the beta carotene naturally stored in its florets which gives it 25 percent more Vitamin A than the common white variety. It was discovered in Canada in 1970 and was shipped to Cornell University where Ag scientists crossbred it with white varieties. It is available most of the year but at its peak in the fall when cool temperatures gives it a deep sweetness. It is slightly sweeter and creamier than its white cousin and can be used in any recipe calling for cauliflower. Purple cauliflower is vibrantly violet on the outside florets, but the stem and core retain a cream color. Purple cauliflower is a heritage variety that comes from either Italy or South Africa. Its true wild origin is not known. One of those “freaks” of nature! It too is milder and slightly sweeter than white cauliflower. The purple color is due to the presence of the antioxidant anthocyanin, which can also be found in red cabbage and red wine. Purple cauliflower also has a variety of names such as Sicilian Violet, Violet Queen and Graffiti cauliflower. field and achieve a crop. Like all cauliflowers, the entire plant (floret, stalk and leaves) is edible. It is sweet and mild. Cauliflower can be prepared in all kinds of ways: raw, steamed, boiled, roasted, grilled and riced. Ricing has become quite the rage. See technique and recipes later in this article. Step aside Kale. Cauliflower is the new rage!